Last week, we started a series of posts on spiritual warfare. Following the outline Paul gives us in Ephesians, we began with “be strong in the Lord, and in the strength of His might” (Eph. 6:10, WEB). 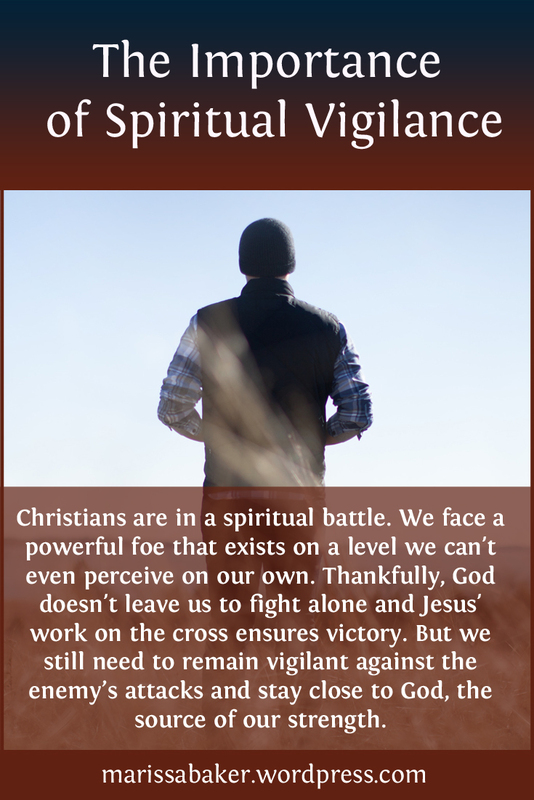 Knowing where we get the strength to fight a spiritual war lays the groundwork. The next point is realizing what we’re up against. No wonder we need to be strong in the Lord! Those are adversaries we can’t even see, much less fight on our own. Thankfully, God doesn’t expect us to. When Jesus came to this earth as a human, lived a sinless life, then died for our sins, He assured Satan’s defeat. It’s such a sure thing that scripture talks of Satan (whose name means “adversary”) as having already been defeated even though he still has a little while to keep influencing people here on earth (Rev. 12:12). Shortly before His crucifixion, Jesus told His followers that the “Prince of this world” was about to be cast out (John 12:31). Other verses speak of Christ having “led captivity captive” (Eph. 4:8; Ps. 68:18) and of binding Satan to destroy his kingdom (Luke 11:17-23). Those all point to the truth that Jesus has already sealed our Adversary’s fate. Jesus has brought the devil to nothing. The Adversary can seem pretty scary at times, but ultimately, he can’t win. Jesus made certain that God wins this fight. So really all we need to do if we want personal victory is to stay on the winning side. All this isn’t to say we shouldn’t have a healthy level of caution. Just because Satan’s defeat is assured doesn’t mean he can’t still affect us. He’s a very real threat and underestimating him can leave us in a vulnerable position. The Adversary is a roaring lion, not a declawed house cat. It seems that Satan spends a good part of his time roaming the earth hunting for people he can target for destruction (Job 1:7; 2:2). He’s called “the deceiver of the whole world,” but seems particularly interested in trying to devour God’s peple as “the accuser of our brothers … who accuses them before our God night and day” (Rev. 12:9-10, WEB). From the story of Job, we know Satan can’t make an unauthorized move against those protected by God. But the same story also reveals that God sometimes withdraws part of His protection to allow trials, suffering, and temptation. Such trials have the potential to produce incredible spiritual growth, which is God’s intention (1 Pet. 1:6-9). But if we’re not careful, “the wiles of the devil” can still trip us up. Even with God’s protection, we still have a role to play in this spiritual battle. He wants us to fight alongside Him and He wants us to stay on guard. The passage in Ephesians talks about “wrestling” against our spiritual adversaries. Both James and Peter tell us to “resist the devil” (James 4:7; 1 Pet. 5:9). We need to be vigilant about actively opposing evil. And that starts with submission to God (see James 4:7). Those are the verses that lead-in to Peter’s warning about the devil as a devouring lion. To stay on our toes spiritually, we need to stay close to God. The warnings about our Adversary aren’t meant to make us anxious — they should to wake us up to the realities of spiritual warfare. Using the term “spiritual warfare” brings to mind some kind of impressive battle. Fending off a barrage of temptations, being persecuted for our faith, experiencing direct attacks from devils — things like that. But the Adversary can be subtle as well as roaring, and we need to guard against those attacks as well. Usually, when we read these passages about the time before Christ’s return, people take the command to “watch” as external — we watch what’s going on in the world to see if He’s coming back soon. 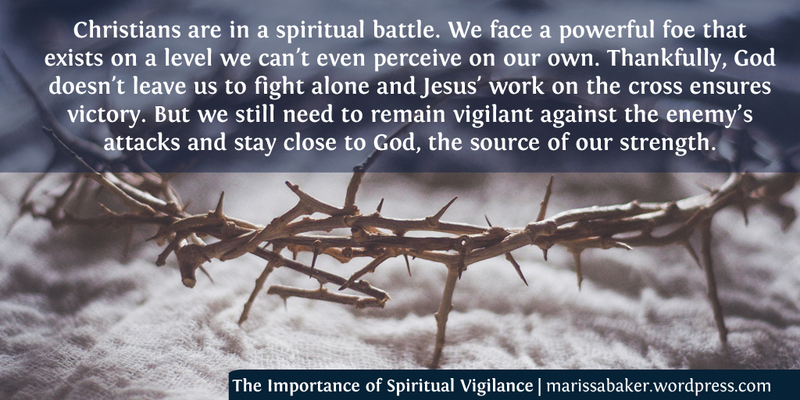 But I think the emphasis is internal — we watch ourselves to make sure we’re still fighting the good fight and following Jesus without distraction. We must stay spiritually vigilant even when things are going well. In fact, it’s especially important then. When we’re battling trials we have constant reminders to turn to God. But when things are good, it’s easy to let our guard down and end up snared by an unexpected spiritual attack. We can’t afford to forget that we are in a war and that the enemy will attack. At the same time, we mustn’t let that knowledge make us fearful because we know the Lord we serve has already won the war. So stay close to God and be on guard.